Croatia, Rab, divesite "Supetaska Draga", size 3 cm, depth 32 m, August 16, 2000. Photo: Franco de Lorenzi. The whole body is translucent white with a dusting of opaque white towards the tips of the oral tentacles and rhinophores. The body appears white from the colour of the viscera, and the ceratal digestive gland ducts range from dark brown to almost black. The anterior foot corners are extended into short angular tentacles, and the oral tentacles are almost as long as the tapering rhinophores which bear traces of annulations, or wrinkles, even when fully extended. The cerata are arranged in 7 groups along each side. The cerata in the anterior three groups have a common stalk which may divide into 2 branches. It grows to approx 30mm in length. 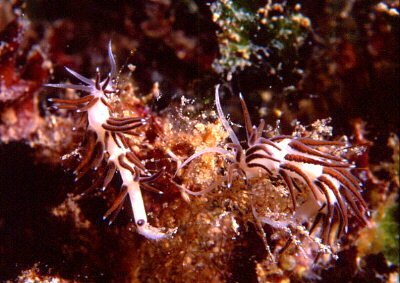 • Vicente, N. (1975) Un nouveau espece de gasteropode nudibranche en Mediterranee Facelina gabinierei n.sp. Trav. Sci. Parc. Nat. Port. Cros., 1: 67-74. Piseinotecus gabinierei - egg ribbon?